You swim into the mountain side cave and for a few seconds all you see is blackness as your eyes begin to adjust to the cave. Gradually you hear what sounds like waves gently rolling up on to a sandy shore and as your eyes adjust you see that is exactly what the waves are doing. The waves are actually riding up onto a sand beach the size of two average bedrooms and there before you sits a beach nestled inside a cave! The best part is the opening is really small so boats can't go in and once you get in it opens up some 40 feet high above you! I used to, and still think, if someone drilled a hold through the ceiling, it would be the most awesome indoor beach where you could still get a tan ever! I always remember that beach and I am sure there are people out there that know the beach I am describing. I also mentioned it in my book "One Man's Dream." The book is centered around The Caribbean, but a part of it takes place in Malta Europe and Comino is fondly remembered in it. Thanks to this site I have decided to put Anguilla on my list and see if it has the same charm that little island in the Med has! From what I read it may have all that and then some... my count down has begun and I, much like Nori's dad, can't wait to explore the entire island. That is what I live for... all things tropical. Even while at work I stop by this site to recharge and remind myself that paradise is not that far away... it was my goal to write a book and get published and I did it. I too plan on settling down on an island much like Anguilla, if not Anguilla herself. From what I read, I'm in for one heck of a treat and I can't wait. Thanks again for the years of recharging, perhaps we will sip umbrella drinks by the beach and this time be looking at the same amazing view at the same time. Faud S. Engineer, author of "One Man's Dream". P.S. Like another reader mentioned, I too feel like I have watched Nori and Yuki grow up while reading the many entries over the years. My daughter Eva will surely grow up loving the islands as you and I have done. Nori's Reply: Faud, thank you so much for your lovely account of this Malta Europe beach. Does the beach have a name? Never have I seen a beach like you are describing. How exotic! I would love to see a photo if you have one. 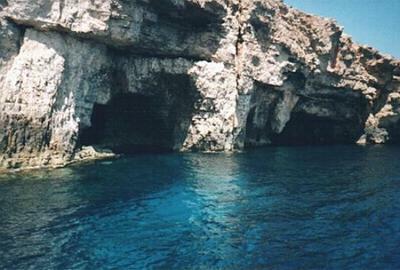 (For now I uploaded a photo of caves in Comino Malta Europe). I am so happy that Anguilla has made your to-visit list! You will be pleasantly surprised, I'm sure, especially if you are interested in Caribbean travel. We have been visiting more Caribbean islands since we have moved to the Caribbean in 2008. Each one is unique, with its own character and feel, different types of beauty and points of interest, but at the end of the day? There is nothing like coming home to Anguilla. Anguilla really is the best Caribbean island. Thank you so much Faud for sharing this secret spot in Malta Europe and for sharing your own story. I hope we are both sipping rum punches on a beach in Anguilla soon. Best wishes and good luck! See you on the beach! Finaly made it home again...Malta. I just saw your reply and am happy to inform you that I just recently returned to Malta after a 28 year hiatus! It was just amazing to return to the same spots and not have it all remain just a distant memory. BTW I currently reside in Prague:) a 2hrs 20min flight from Malta. have an amazing day and all my best to your amazing family..Ahoj Suki! I have read Mr. Faud Engineer’s article in your site. Initially I was surprise to find this sort of content in a Caribbean site so far away from our little Maltese Island in the Mediteranean Sea. As I was searching for Comino beaches and scrawling down the Google results I saw your photo and your site name. Initially I could not understand, so I opened the link to read what it was about. It is a lovely article in order to explore the beauties of nature. I heard of this location, but I never dived in such waters as i am not a great enthusiast in diving. I am going to ask very close friends they have a diving school in Malta and will check if they have photos of this area. I will then send them over to you and any other information that I will find. You have a great site, you have a very unique way of communicating.